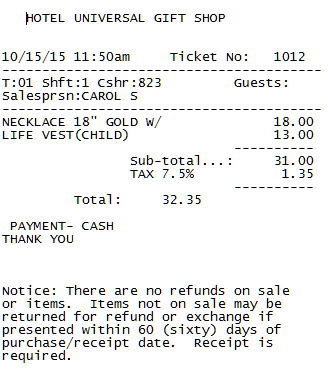 You can add a comment, or "Check Message" to the end of the guest check from the Store Record. This will print at the bottom of each guest receipt. Adding the comment requires you to open the Store Record. This must not be done while other terminals are actively opening and closing checks. This could cause application hangs and discrepancies in the check number. If you must open the Store Record, please make sure everyone else takes a break from opening and closing checks. You'll have to be a POS Administrator to do this. 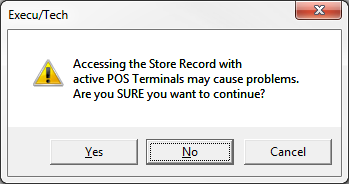 From the POS Administrator menu, select Store Record. When you select Store Record, you'll see a warning. "Accessing the Store Record with active POS Terminals may cause problems. Are you SURE you want to continue?" Make sure you've followed the suggestion in the warning box, above, and click Yes. Once the Store Record is open, you can edit the Check Message. You have 3 lines of 40 characters each. Once you've finished, save and close the Store Record. If you require longer or fancier check comments, check with the manufacturer of the printer. Often they offer extensive check commenting functions from their own driver. To add a second comment, such as a disclaimer, at the bottom of the receipt, click the "Ck message" button on the bottom of the Store Record screen. Enter the message you want to print on the receipt. Make sure to type 40 or fewer characters per line and press Enter at the end of each line; otherwise it will not print correctly in the receipt printing format. Click Done to save and close the window. Then click Yes at the Store Record screen. Here is a receipt with the standard comment "THANK YOU" and the additional comment below that. Hotel PMS guest folio comments can be added in the Parameter Record . If you want to edit the hotel guest folio template, click HERE for instructions.